KJIPUKTUK (Halifax) -- It seems like Corridor Resources has some well connected friends. 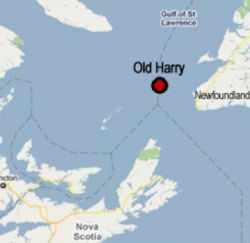 On Friday, January 15, the oil and gas company received yet another extension to its Old Harry exploration lease in the Gulf of St. Lawrence. This time, federal ministers and their provincial counterparts in Newfoundland ratified the existing Atlantic Accord legislation, so that Corridor can sidestep the $1 million it would have earlier had to pay to extend and secure this lease. The Canada Newfoundland and Labrador Offshore Petroleum Board, the arm's length organization in charge of finalizing offshore leases for the province, explained this ratification as being related to regulatory factors that had hindered Corridor's ability to drill a validation, or exploratory, well. That, or it could just be that Corridor Resources, like so many junior exploration and extraction companies, is going broke and hasn't been able to afford the price of an offshore well. Corridor, as of January 18th, was in a year long nose dive and was trading at 44 cents per share. Without a senior partner to fund the Old Harry project, and with the federal government dragging its feet on the necessary Environmental Assessement of the project, for the moment it seems like the Offshore Petroleum Board is content to keep Corridor on some kind of life support system. It's not sitting well with Mary Gorman, of the Save Our Seas and Shores Coalition, who feels like its time to pull the plug on Corridor once and for all and on top of that instill a drilling moratorium in the ecologically fragile Gulf of St. Lawrence. In the following interview, we speak with Ms. Gorman about Corridor, Old Harry, and the general disillusionment felt after decades of fighting to protect the Gulf. Due to the shoe string budget of our website, you'll be able to listen to the audio attachment on a laptop or home computer. If your using a phone or tablet, you can download the audio, but can't listen to it right off our site. Sorry!